The opening week of odd-year legislative sessions is traditionally dominated by organizational matters such as electing leaders, establishing committees and formally submitting the first round of bills. Although 2017 was a stark departure from that tradition, this year’s opening week reverted back to a more traditional fashion, with one exception, and that exception made this session’s start unlike any other. For the first time in Kentucky history, a legal contest of an election was filed with the Clerk of the House of Representatives. The contest centers on State Rep. Jim Glenn (D) of Owensboro, who won his election last November by a single vote. At the heart of the debate are seventeen (17) absentee ballots that were unanimously rejected for non-compliance by a bipartisan group of local election officials in Daviess County. A standard re-canvass by Election officials did not change the outcome. Rep. Glenn’s win was certified both locally by the County Clerk’s Office and statewide by the Secretary of State’s Office, and he was sworn into office. However, Rep Glenn’s opponent, former Rep. DJ Johnson (R) filed the contest questioning the ruling of the aforementioned 17 disallowed absentee ballots. The Speaker of the House allowed the contest to proceed, and as a result, nine legislators (6 Republicans and 3 Democrats) were randomly chosen to comprise a panel that will review the matter and issue a report. The full House will then decide whether to accept or reject the findings and determine what should happen next. Proponents that support this contest have said that every effort should be made to insure that every vote is counted. Sounds reasonable. But opponents correctly point out that local election officials (a bipartisan group) have already unanimously ruled on the 17 ballots, and allowing even the possibility of randomly-drawn legislators overturning an election with a politically-partisan vote could create a very dangerous precedent. The contest panel has met twice thus far. The first meeting was simply standard procedure with an appointment of a Chairman and some direction as to how the panel would proceed. However, fireworks began in the 2nd meeting as serious concerns and objections were raised by Democrats on the panel when it was revealed that the 17 absentee ballots in question were unknowingly already in the custody of the House Clerk, as opposed to being secured in a locked safe. The Chain-of-Custody process of the handling and transport of these ballots from Daviess County to Frankfort was brought into question, and definitive answers as to the assurance of proper protection protocol have yet to be produced. I will keep you informed of the results of this contest in a future update. Because last week was more about organizational matters, no bills were debated in the House. Several prominent ones have been filed, however, including ones affecting school safety and medical marijuana. I will discuss them and other issues in a future update. On a very positive note, I sense a real difference in some of my colleagues from the opposite side of the isle wanting to reach out to me. I do not know if this is a direct result of my efforts to do the same for the past two years, but I’m encouraged. 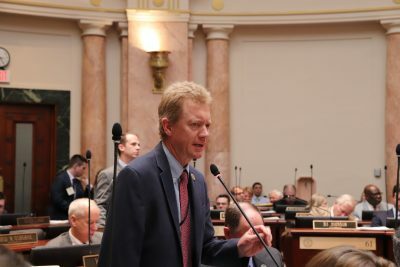 Many of you are very aware of my frustrations of political partisanship & division here in Frankfort over the last two years, as I’ve written about it often. But this week brought signs of that changing. I hope that continues. In that light, I have been working on organizing a bi-partisan, balanced special legislative caucus that I’m really excited about. Although I’m not at liberty to share the details quite yet, an announcement will be forthcoming in a few weeks. At this time I will just say there has never been a caucus like this in Kentucky, and it is long overdue. More on that later. As for Standing Committee assignments, I am proud to say that I will continue serving on several important to our district. These include Transportation, Economic Development & Workforce Investment, and Licensing & Occupations. My leadership has also appointed me to the statutory committee of Program Review & Investigations. I’m honored to serve on these four committees, and look forward to injecting my expertise in these areas. I strongly encourage you to follow the legislative process and to let me know your views on the issues before us. You can always email me at [email protected], and you can call a toll-free number to leave a message for me or any other legislator. These phones are staffed year-round but are kept open longer when the legislature is meeting. That number is 1-800-372-7181, and 800-896-0305 for the hearing impaired. You can also follow me on Twitter @KyAlGentry, facebook, or my website at www.AlGentry.com. The General Assembly’s website has a considerable amount of information the public can use, including the full texts of bills and meeting times for our committees. That can be found online at www.lrc.ky.gov. KET does a phenomenal job of keeping the public informed as well. It airs many legislative meetings and keeps them archived, and there is also a smartphone app you can use. To learn more, click on its website at www.ket.org. Under the constitutional rules for odd-year legislative sessions, the General Assembly will not meet again until Feb. 5th, and we will wrap up our session by the end of March. I look forward to hearing from you soon. Paid for by the Committee to Elect Alan Gentry, Edwinna Barker, Treasurer.